It is an odd time to be in Pittsburgh for sports reasons. Football is over and baseball hasn't started; hockey, thankfully, is getting into the home stretch of games that Actually Matter (tm), so that's exciting. Still, for a time period where there is only one active sport in this city, there is a TON of news. 1. The perennially hapless Pittsburgh Pirates acquire A.J. Burnett from the New York Yankees (!) for around $20 million , the first time the Pirates paid for a player with money that wasn't simply found under the cushions at Seven Springs. 2. On the second day of training camp, he bunted and the ball cracked his orbital bone. That's all you have to know about the Pirates. Yeah. So, I'm not a fan. I understand the boring old singular figure style is out, but if you are there to commemorate a specific player, it's nice if the non-commemorating players depicted don't outnumber the center of attention. 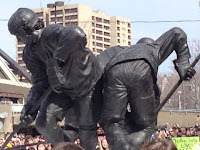 I get it--the sculpture is based on a famous photograph from Sports Illustrated from 1988--but it's a little too busy to be an appropriate tribute, I think. Finally, the Steelers have been on a tear chopping players from their team and making the others taking Brillo pads to their lockers just in case. They released long-time players Aaron Smith and James Farrior, and chose to not place a franchise tag on rising star (and restricted free agent) Mike Wallace. The worst, of course, is Dancing With The Stars champ Hines Ward, a fan favorite and a player that's been good to the team for a decade or so. Most of this cost-cutting is, sadly, understandable--even with some aggressive renegotiations of existing contracts, the team has to stay under the salary cap. Ward, in particular, was embarrassingly unproductive this past season, charting only a third of the yards he did only two seasons ago, and much of that was charity to get him to 1000 catches. Even keeping him in place as a placeholder/mentor at minimal cost was going to be too much of a drain to the team as a whole. He probably should retire, but he also probably won't, grabbing a decent paycheck and act as a veteran player for some team with a weak receiving corps. Sports have been reasonably good to Pittsburgh for the past few years, but fans are going to see a slow, sometimes ugly descent from the high of two or three years ago, when we had both a Superbowl and a Stanley Cup victor. In today's competitive, parity-driven sports climate, that's the way it goes.